A video of a mother bear charging at tourists shows why it's best to keep wildlife at a safe distance. 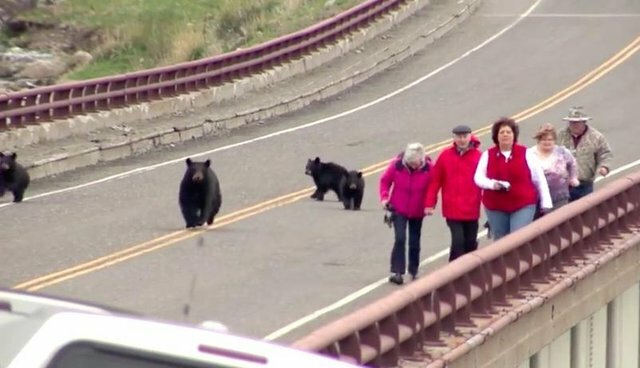 The video, which was posted by the Montana Fish, Wildlife & Parks (FWP) department on Friday, shows a mother black bear leading her three cubs in an ambling charge against a group of onlookers at Yellowstone National Park. It appears that people had gathered to watch and photograph the little family when the mother bear decided she had had enough and started to herd them off the bridge. While the onlookers can be seen running away, the little bears seem to have enjoyed it - at one point one of the cubs stops to take in the view over the bridge's railing. Interacting with wild animals can be dangerous for them as well, as placing an animal like a black bear in a stressful situation can force them to display defensive aggression. And if they do, local officials will often treat the animal as a "threat" and preemptively take action, such as euthanization. Fortunately, this little encounter had a happy ending. FWP reported that all the onlookers walked away safe, while the bear family happily returned to the woods.